Every week, I teach first grade religious education at my church. It is an after school program and we only have 90 minutes each week. Our sessions start in October and go until the end of April. Because of this shortened year, we have a lot of learning to fit in to a short amount of time. Anytime we can double dip, I try to do that. This year I decided to add a study of Catholic saints to our sessions. 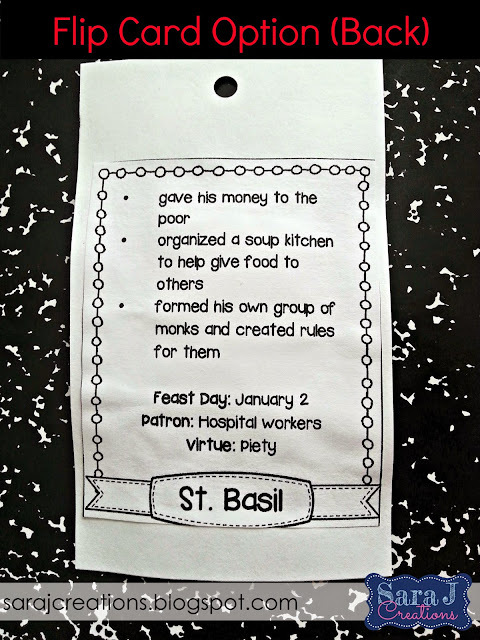 My thought was to have a saint of the day that the students would learn a few basic facts about. 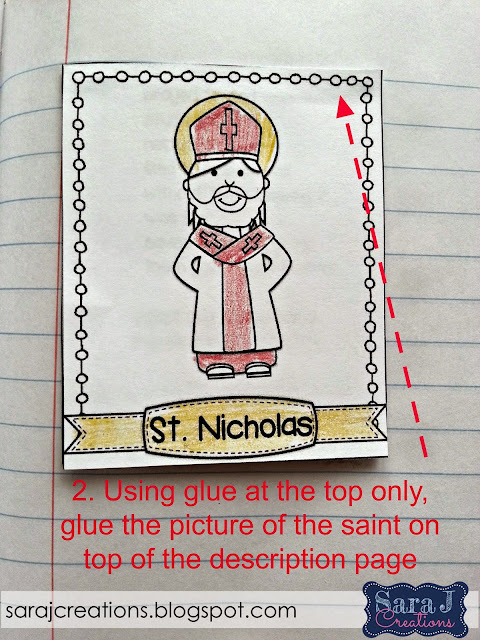 In my head I planned to make trading cards for each saint and then the students would keep them on a ring - a flip book of sorts. Then our program decided they wanted us to teach students about the virtues. 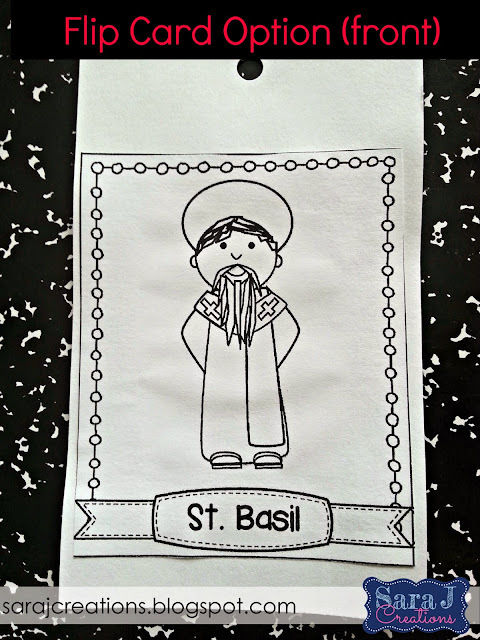 I decided to incorporate this into my saints cards, so they would learn about the saint and which virtue they demonstrated. 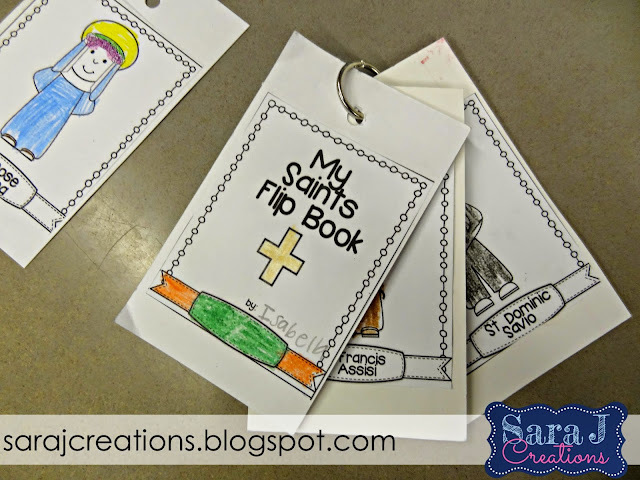 This year we are doing the flip book method. So far, the kiddos are loving it. They ask about who the saint is and are excited to get their new card and color it. 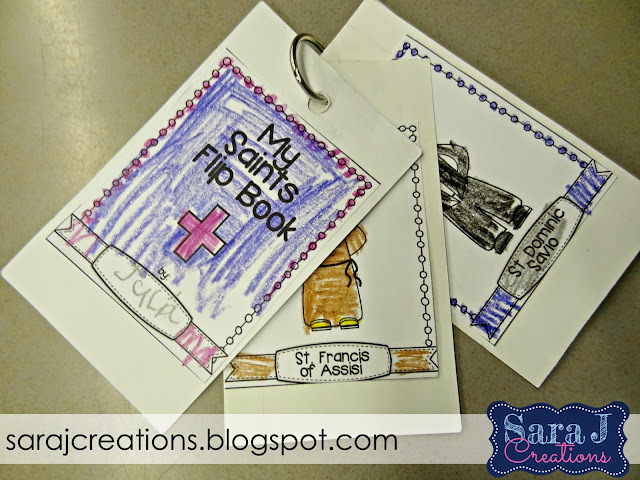 Then at some point throughout the lesson, we use an anchor chart and sometimes a book about saints and talk a little bit about the saint for the day. If I were to do the flip book method again, I would probably copy the two pages back to back on cardstock for durability. I think it would save me a lot of prep time each week. Ideally I would have the students glue the pages onto each card but since our time is so limited, I prep them at home. My plan next year is to use the same cards but use them as an interactive notebook. 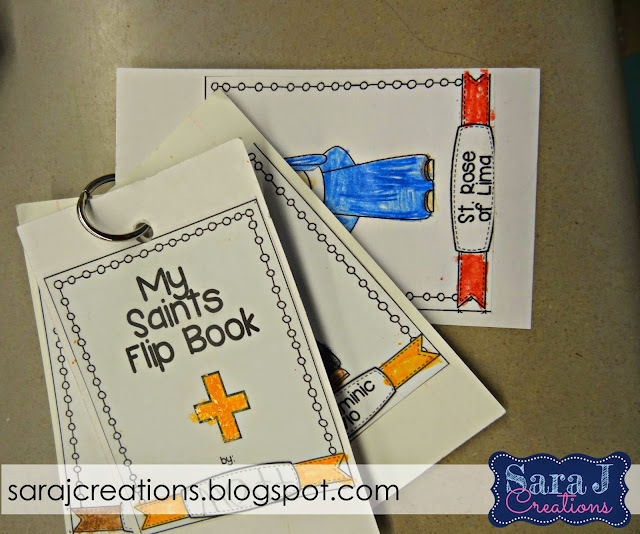 I plan to get each of my students a small notebook to keep all of their saints together. 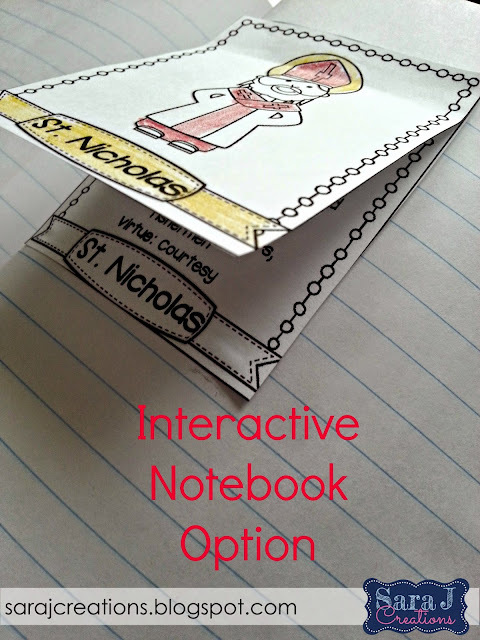 Here is how you can turn the same cards into an interactive notebook. 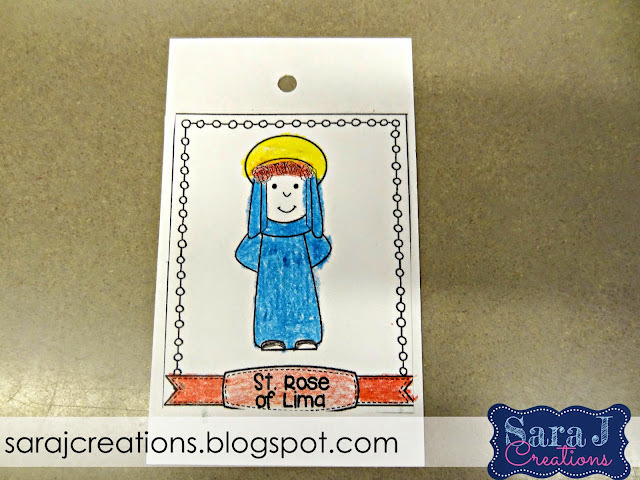 These cards could also be used for a memory game, flashcards, or even be used to play Saint Go Fish. For each saint there are three pages included. The first is a picture with label of the saint in black and white. The second is a fact sheet about each saint. It includes a few basic facts about his/her life. It also includes the feast day, what thing (s) they are the patron of and which virtue they demonstrated in his/her life. The third page combines the first two only in a colored version. 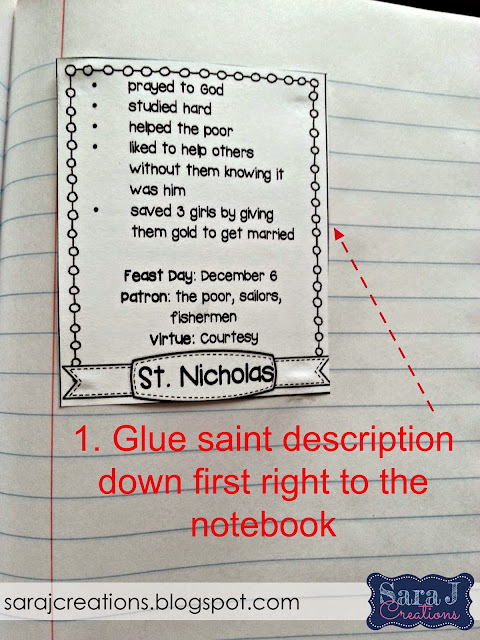 This is designed to be an anchor chart/poster to display in the classroom when learning about each saint. This has been my favorite addition to our classroom this year. The students are excited each week and they are learning a few facts about saints. So it is a win win! Click HERE to find this awesome resource in my TpT store.